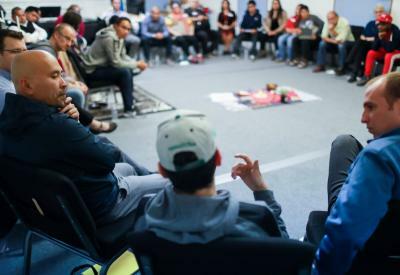 When the King County juvenile justice system in Washington State first desired to offer restorative justice practices for its youth and families, it sought the counsel of Saroeum Phoung, a peacemaking circle consultant and trainer out of Boston. Saroeum, who was trained in peacemaking by the Tagish Tlinget First Nation people of the Yukon Territories, surprised the county by initially refusing to provide the practice for clients. Why? Because circles, among other things, are grounded in the understanding that you can’t change anyone else; you can only change yourself. In other words, if the county really wanted to infuse restorative justice into its structure, it would first have to begin with itself, recognizing itself as part of the problem. Most government systems would have faded away at that point, but – astonishingly – King County said “Yes” and invited Sarouem to come to Seattle to begin the process. For the next few years, county justice officials including judges, administrators, detention staff, probation counselors, attorneys, etc. began sitting in circle. Dirty laundry was aired, replaced instead with understanding, trust, and respect. Peacemaking circles became common practice for everything from high level staff meetings to conflicts on the detention floor. Employee satisfaction spiked at record levels as people became more connected to one another. From this place of internal transformation, the county then moved toward youth and families, seeking to manifest similar healing for people impacted by felony level crimes, a bold and unique move. A Peacemaking Coordinating Team was established to lead the effort. First up, a young man facing a felony robbery charge. Rimon was a troubled teenager who – if convicted in traditional court – was facing two years in the state’s juvenile detention system at the taxpayer’s expense. Instead, with the victim’s permission, Rimon was diverted to a community-based peacemaking circle process which, for the next year, would gather together everyone impacted by the incident plus community and justice system participants. While this pilot case was unfolding, the county again made a trailblazing move: It sought partnerships from faith communities, nonprofits, schools, police, and community members. All were invited to help usher in this new and better way of addressing crime. The Catholic Archdiocese of Seattle recognized the emergence of the Gospel in the county’s efforts and immediately hopped on board, offering staff to the Peacemaking Coordinating Team and joining Rimon’s circles. Protestant churches joined as well. All of a sudden, unlikely partners were all playing in the same sand box, united by values of reconciliation, redemption, and transformation. As Rimon was finishing up his process of healing and accountability, the local Catholic Church worked vigorously to build infrastructure for the county. Catholic spaces were readied for both circle gatherings and training events. Parishioners in the pews were informed of the movement and invited to participate, beginning with themselves just as the county had modeled. Remarkably, the county’s grant extended to churchgoers, allowing them to receive peacemaking circle training for free. Seattle’s St. James Cathedral formed a juvenile justice committee and established itself as the first restorative justice hub for the county’s use. Today, a team of Catholics stand ready to accompany people impacted by crime, allowing them to transform their pain, rather than transmit it. And Rimon? He successfully completed his process and, as part of his sentencing, found himself at St. James Cathedral for his own circle training, allowing him to help lead the practice for others. He’s currently employed as a security guard while studying at a local college. He still assists with community circles. Several additional teens with felony charges have followed in Rimon’s footsteps with most achieving similar life-changing results. And the Catholic Church, among others, continues to walk alongside them. Now is the time for us, as Catholics, to shout this movement from the rooftops. Let us preach this particular Gospel manifestation with ardor such that all other jurisdictions desire to do the same. After all, the kingdom of God depends on it.